So recently we switched pools for H’s swimming lessons, as her old one was full of classes from another centre, which left no space for her. She went with the other centre’s classes for a few weeks but ten to a class and shivering at the side of the pool didn’t really seem like a good way to spend my money. So we switched to the pool we live practically next door to, paying twice the price but having a maximum of four to a class. Today was the first end of term. 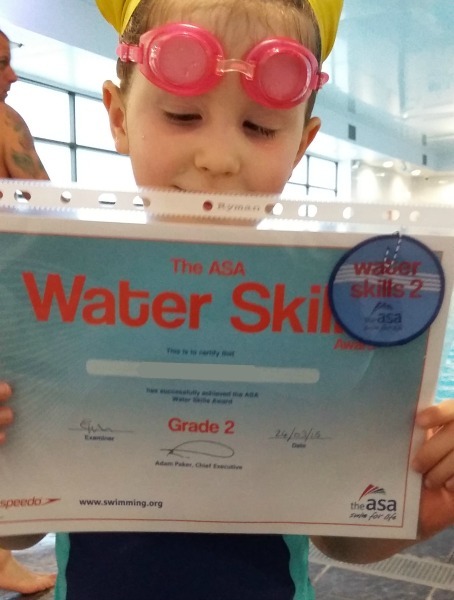 She was awarded a badge, ‘Swim Skills 2’ which was great – she came over to me with it at the start of the lesson, a big beaming smile, full of happy. She’s very motivated by badges and stickers. Towards the end of her lesson they joined up with the other group, doing a relay game. While H’s team didn’t win, her competitive streak came out – and she did half a length of front crawl without wanting to grab the side – I knew she could do it! She’s been able to do it in the past in our old pool, but this one is a little bit deeper so she lost her confidence a bit – but having her mind on something else has meant she just went for it. I was really proud of her, and her happy beaming face afterwards makes me think she might have been proud of herself too. H’s swimming lesson in the Yellow hats wasn’t a huge success, so we made plans for her to try in my gym pool as I can take her for free on a weekend until she’s five. We probably did around 45 minutes of swimming, and the first 20 of those were H swimming front crawl and back stroke almost half the length of the pool on her own, with a bit of help when she needed to come up for air (due to the pool depth – 1m20) – and no floats. I can see she’s nearly there – she just needs to master taking a breath and not panicking – the luxury of the training pool where she has her lessons means she can stand up for air – and she needs to get out of the habit and practice keeping swimming. A few more sessions and maybe we’ll crack it? Part of me thinks I should find a different club for her to swim where the pool depth won’t be an issue, but the other half thinks she’ll do fine once she stops panicking when she remembers she can’t just stand up and has mastered coming up for air – like I said, she’s nearly there. We got out a noodle for her to have a kick up and down the pool, which she did well – she has the stamina, it’s just a lot to do and she is still only four anyway, so I don’t expect the world. Funnily enough the noodle gives her the support on her upper body that she needs to be able to breathe. Yesterday evening she put her toothpaste lid into her mouth. Shaun insisted she took it out immediately (which then provoked an angry reaction from H) which led to me spelling out the consequences had she swallowed it by mistake. For the first time in her life I had to say “because you could die” which gave her the biggest scare she’d ever had in her life. Extreme? Possibly, but now she’s almost five it’s time to drill home ‘consequences’ that bit more. She wouldn’t put Lego in her mouth, but would do a toothpaste lid? No sense to that decision in my logical world. Last night we cuddled on the bed until I knew she was calm again. I tried to tell her as calmly as possible so as not to scare her too much, especially as I didn’t want her to have nightmares. I don’t think her life was ever in danger, but she’s really testing the limits with things she’s not tried before. I’ve insisted she checks with us first – I’d like to think we’re fairly relaxed with her and allow her to do a lot of things, but new boundaries need to be set for a while, if only so we know what she’s thinking. Personally I’m finding a toothpaste lid pretty gross! This morning we talked about consequences again without mentioning death, giving me time to think of things which you shouldn’t do which she’d understand (like crossing the road in front of a bus, or playing with fire). I’ve never seen her quite so scared as I did last night – so starts the unpicking of this wonderful world she thought she lived in, as we start to discover there’s danger in most places. Sigh. … at least you gave it a go. Right? This afternoon H was invited to join the yellow hat class at swimming to see if she could cope with the big pool, a colder temperature and deeper water. She didn’t. She was hanging on to the side, it was a bit of a shock, even though she’d been in there before. But she really tried. Really really tried. She did some front crawl underwater but I think she was bothered by the difference between the two pools. I was so proud of her. I knew she wasn’t ready. She could see me as she swam (and said it helped), but she needs a bit more time in the Orange Hat group. I reckon in 2-3 months she’ll be on track and ready, plus we’ll practice in the pool near us which is deeper but warmer. We’re in no rush. The lady shook her head and said H was hopping down the pool. Aaah, just like I did (except I was seven or eight, not four) when my teacher tried to get me to do my 50 metres. I’d done my 25 easily but was getting tired. I figured if I hopped but kept one leg going my teacher would never notice. She did. She’s four and three quarters. An awfully wise four and three quarters, it would seem. Better get those last few free swims in before she turns five…. So much to write about, so little time. So I’ll do bullet points instead. • I bought the DVD of the 1970s Famous Five for H to watch. She loves it, and will sing the theme on repeat for hours. I do like passing on my childhood to her. There is an ulterior motive, as I saw the entire Famous Five collection has been reissued recently with artists from these days (like Oliver Jeffers and Emma Chichester-Clark) have done the covers. My 1970s collection is long gone, but H’s 2014 collection starts now! • Football went a bit wobbly last night. They changed the format slightly which led to an anxious H who couldn’t do it straight away so she got upset. All the kids got a bit upset through the lesson. I forget how used to a routine they are – from seeing ten or so kids laughing and being happy and running around, it went to ten slightly cross ones and a few frustrated ones. However, getting a medal and certificate for the work done at the end meant H cheered up. We’ve not lost hope. • Swimming is coming along marvellously too. She got her Duckling 4 & 5 badges tonight which she’s been due a while, so we can leave the Duckling stages behind and keep going to Stage 2. She’s almost there but we’re holding her back until she gets confidence in water as deep as she is tall, rather than the training pool. • Reading is coming on well too – she moved up to the Orange band at school. I had no idea what the bands meant until I found this link, which says Orange is Year 2. Yikes! Knowing how much her school are strong on literacy I do wonder whether their grades may be higher, but nonetheless I’m still proud of her. She will happily sit and read a chapter of a book in her head, if she doesn’t know the tricky word she’ll keep reading to work out what the word can be, and ask if she’s really not sure. • After School clubs have started for Reception kids – she had her first one last week. Add to that several playdates after school and things are pretty busy at the moment. With half term only a couple of weeks away this year is flying by. She isn’t too tired by it and learned a lot – mainly that electricity and water can start a fire and isn’t a good thing. Glad they’ve got them learning these things at this stage, I wouldn’t have thought of it! We’ve been taking H swimming since she was a baby. She’s gained her Duckling 1, 2 and 3 badges as well as Stage 1, and is progressing well in her lessons. Before Christmas I joined my local pool, and as she’s under five I can take her for free whenever I want, as long as it’s a weekend. So today we did just that. She’s terrified of deep water. Anything she can’t touch the bottom in she panics, and we needed to get her to move on from it – to see it wasn’t that deep really and she can actually have good fun in it. We swam for about twenty minutes, kicking up and down the pool before she announced she wanted Shaun and I to hold each end of a noodle/woggle so she could swim underneath it. This would mean we don’t hold on to her and she’s using no flotation devices. And… she did just that. Swum on her front towards me, going completely underwater and doing crawl, reaching out for the side (she has goggles on), and swam on her back towards Shaun where he caught her before she reached the side, while going under the arch we’d created. She did this several times but was still worried about the water depth. So I made up a new game. Telling H to hold her nose and take a deep breath, I was going to let her drop to the bottom of the water. When her feet touched the bottom she had to bend her knees to push herself up again, we called it ‘the rocket game’. Incredibly, that seemed to work! Within a minute or two she was demanding we do it ‘again’ to the point she wouldn’t do anything else. Afterwards she told me “the deep water isn’t so scary really mummy” which was nice to hear, very nice indeed. She’ll still use a float until her confidence is there, but right now she’s doing me proud again, and she’s working it out on her own terms which is exactly the way our parenting seems to have gone – from doing Baby Led Weaning to how she learns at school. She wants to do the things she does and often tries beyond her comfort zone and I’m so proud of her for trying. More often than not she’ll give up or find it too hard or just cry as “I’ve never done that before” (standing forwards in the shower – she prefers to face away from the water), but more and more she’s just getting on with it, and it’s making things so much easier, thank goodness. I read so many blog posts where various swimming schools send bloggers and their child out on a free trial for a term to learn to swim. This isn’t one of those posts. I don’t really review things on here that often, and this isn’t a review. We’re lucky we can afford to pay for H to have lessons, and she has since she was nine months to a year old. We’ve changed teachers a few times, but kept our lessons on the same day. Swimming has to be one of the best things we’ve done with H. Her first lessons were as a baby in the water singing nursery rhymes and bobbing her around – there was no underwater swimming in these lessons, just getting our babies used to the idea that they can have fun in the water and it isn’t about bathtime. In fact, that pretty much continued until she was old enough to go into the pool on her own – something I wasn’t ready for, but something she was more than ready to do! After that it was seven children to one teacher, a number which felt quite high but is apparently the maximum you can have at that age. Our local pool has a coloured hat guide, the red hat seems to cover Duckling Badges 1, 2 and 3, as well as Stage 1. Once you get your Stage 1 you move up to the Orange hats which encourages even more independent swimming. There’s quite a difference between the red and orange hat groups too. A lot of the time in red I’ve noticed it’s about listening to the teacher and swimming when they request you to come forward (or take you around the pool), building up your discipline and water confidence, whereas with orange it’s swimming alongside the rest of your class but listening to what the teacher asks you to do. Right now H can swim almost a length underwater which is a huge deal to me – I used to be able to do this. She likes to stand up in the pool to have air at intervals, so hasn’t got the hang of swimming and bobbing her head up, so that’s what they’re working on right now. I know we’re still a way off that and I’m in no hurry – according to the guidelines children heading towards their fifth birthday are moved into the orange hat group, so I know she moved up early. I’d like to think this was down to having good discipline in the water from previous lessons. A year or two in the orange hat groups would be wonderful, but of course the teacher then goes and spoils it by giving me a wobble. Last week they went into the main pool!! They all jumped in and were guided to the side by the teacher but it was TERRIFYING (in a scary but proud sort of way) – H looked like she was going to jump before the teacher was there which was very very scary (for me) but listened and waited. She did it fine, and coming from the little girl who used to be scared of jumping in the pool in our last lessons we had (in a different pool), I’m really proud how much she’s come on. If you’re thinking of starting swimming lessons, send your child when they’re as young as possible if you can. It’s when you hear stories about schools going to the pool and some children have a terrible fear of swimming that you realise how valuable these lessons will be as she gets older. Even just going to the pool and having a play is a huge advantage. I know I have my mum’s fear of water which has probably given me my fear of deep water. In H’s life I’m trying to put right the things I feel are wrong about mine – this one was a nice straightforward one to do. Phew.